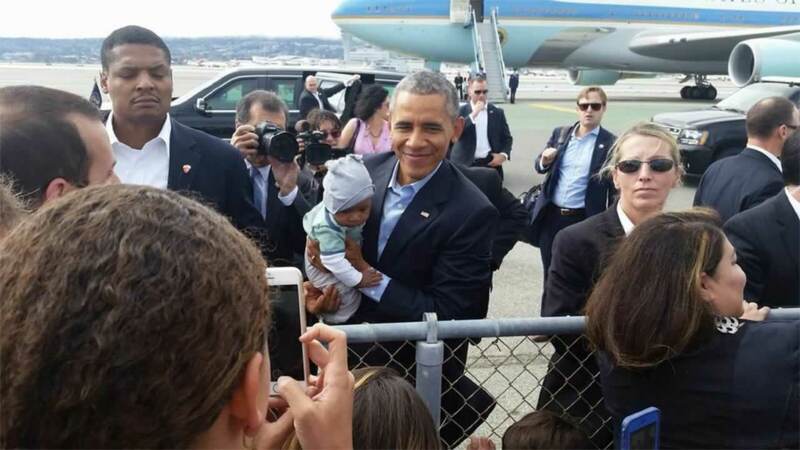 SAN FRANCISCO INTERNATIONAL AIRPORT (KGO) -- An Oakland family will always remember the moment President Obama embraced their baby boy at SFO shortly before taking off for Los Angeles. Joseph and Monique Gunter were invited to the president's send off and the Commander-in-Chief took notice of Joseph III. "You know how always think of those candid shots of president and baby, and so we really hoped he would. And we thought it would be far-fetched and when he said, "Give me that baby," I think we all just kind of swooned and melted," Monique said. Family members snapped photos just a few feet away from the president and little Joseph.